My palms are clammy, heart-rate is elevated, and sweat has begun to drip down my brow. There I sit with my hands clenched in the doctor’s office waiting room. I’m trying to mentally prepare for the inevitable poking, prodding, and personal invasion, which will likely involve numerous compromising cavity searches from head to toe. The fun usually doesn’t end until a finale of needle piercing vaccinations and blood tests are completed. Investors have been nervously sitting in the waiting room of the Federal Reserve for the last nine years (2006), which marks the last time the Fed increased the interest rate target for the Federal Funds rate. In arguably the slowest economic recovery since World War II, pundits, commentators, bloggers, strategists, and economists have been speculating about the timing of the Fed’s first rate hike of this economic cycle. Like anxious patients, investors have fretted about the reversal of our country’s unprecedented zero interest rate monetary policy (ZIRP). Despite dealing with the most communicative Federal Reserve in a few generations signaling its every thought and concern, uncertainty somehow continues to creep into investors’ psyches and reign supreme. We witnessed this same volatility occur between 2012-2014 when Ben Bernanke and the Fed decided to phase out the $4.5 trillion quantitative easing (QE) bond buying program. At the time, many people felt the financial markets were being artificially propped up by the money printing feds, and once QE ended, expectations were for exploding interest rates and the stock market/economy to fall like a house of cards. As we all know, that prediction turned out to be the furthest from the truth. In fact, quite the opposite occurred. Investors took their medicine (halting of QE) and the market proceeded to move upwards by about +40% from the initial “taper tantrum” (talks of QE ending in spring of 2012) until the actual QE completion in October 2014. The thought of rate hike cycles are never fun, but after swallowing the initial rate hike pill, investors will feel just fine after coming to terms with the gentle trajectory of future interest rate increases. The behavioral model of 1) investor fear, then 2) subsequent relief has been a recurring process throughout economic history. As you can see below, the bark of Federal Reserve interest rate target hikes has been much worse than the bite. Initially there is a modest negative reaction (approximately -7% decline in stock prices) and then a significant positive reaction (about +21%). Even if you are convinced rate hikes will cause an immediate recession, history is not on your side as shown in the study below. On average, since 1955, the time to a next recession after a Fed Rate hike takes an average of 41 months (ranging from 11 months to as long as 86 months). As a middle aged man, one would think I would get used to my annual doctor’s check-up, but somehow fear manages to find a way of asserting itself. Investors’ have been experiencing the same anxiety as anticipation builds before the first interest rate hike announcement – likely this week. Markets may continue their jitteriness in front of the Fed’s announcement, but based on history, a ¼ point hike is more likely to be a prescription of economic confidence than economic doom. Everyone should feel much better leaving the waiting room after Janet Yellen finally begins normalizing an unsustainably loose monetary policy. This article is an excerpt from a previously released Sidoxia Capital Management complimentary newsletter (December 1, 2015). Subscribe on the right side of the page for the complete text. It’s that time of year again when an estimated 135 million bargain shoppers set aside personal dignity and topple innocent children in the name of Black Friday holiday weekend, doorbuster discounts. Whether you are buying a new big screen television at Amazon for half-off or a new low-cost index fund, everyone appreciates a good value or bargain, which amplifies the importance of the price you pay. Even though consumers are estimated to have spent $83 billion over the post-turkey-coma, holiday weekend, this spending splurge only represents a fraction of the total 2015 holiday shopping season frenzy. 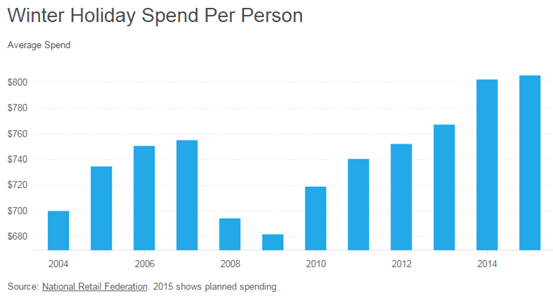 When all is said and done, the average person is projected to dole out $805 for the full holiday shopping season (see chart below) – just slightly higher than the $802 spent over the same period last year. While consumers have displayed guarded optimism in their spending plans, Americans have demonstrated the same cautiousness in their investing behavior, as evidenced by the muted 2015 stock market gains. More specifically, for the month of November, stock prices increased by +0.32% for the Dow Jones Industrial Average (17,720) and +0.05% for the S&P 500 index (2,080). For the first 11 months of the year, the stock market results do not look much different. The Dow has barely slipped by -0.58% and the S&P 500 has inched up by +1.01%. 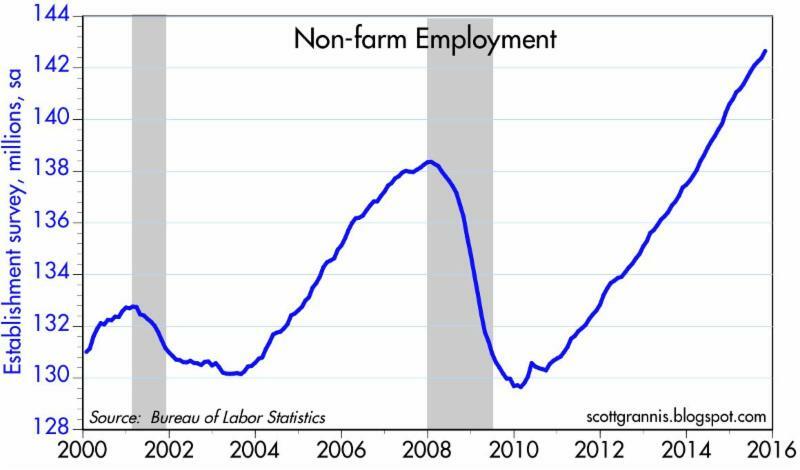 Jobs Piling Up: The slowly-but-surely expanding economy has created about 13 million new jobs since late 2009 and the unemployment rate has been chopped in half (from a peak of 10% to 5%). 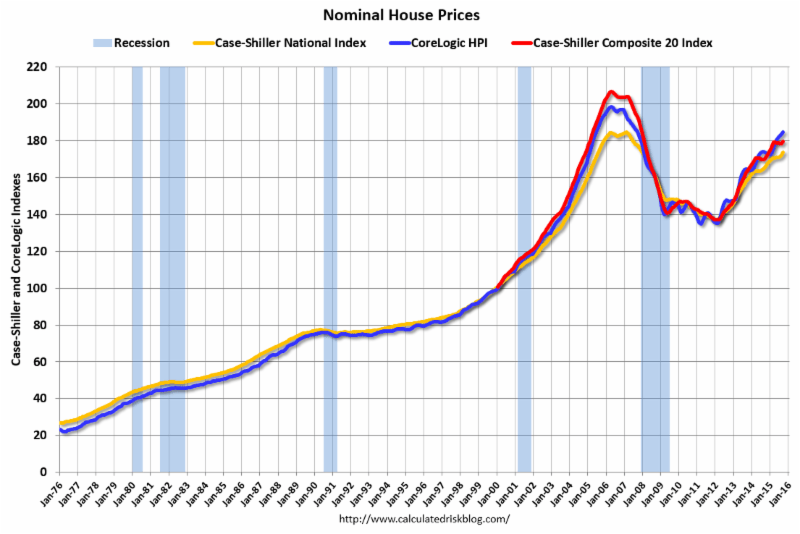 Housing Recovery: New and existing home sales are recovering and home prices are approaching previous record levels, as the Case-Shiller price indices indicate below. 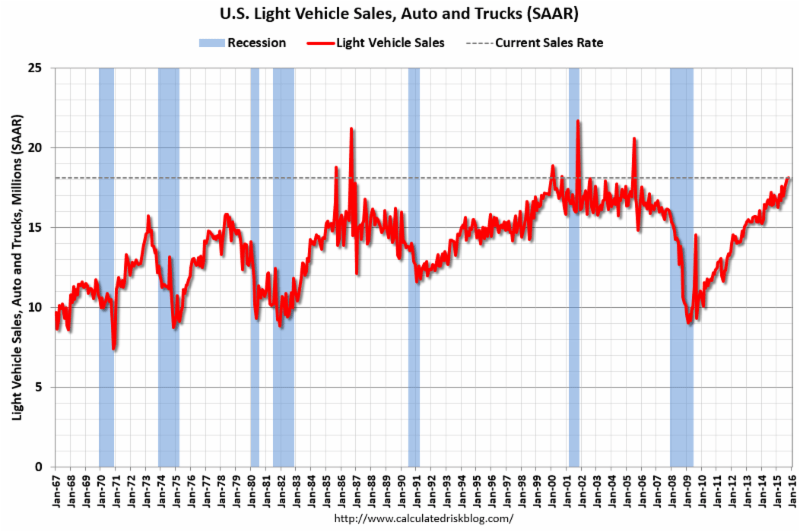 Strong Consumer: Cars are flying off the shelves at a record annualized pace of 18 million units – a level not seen since 2000. 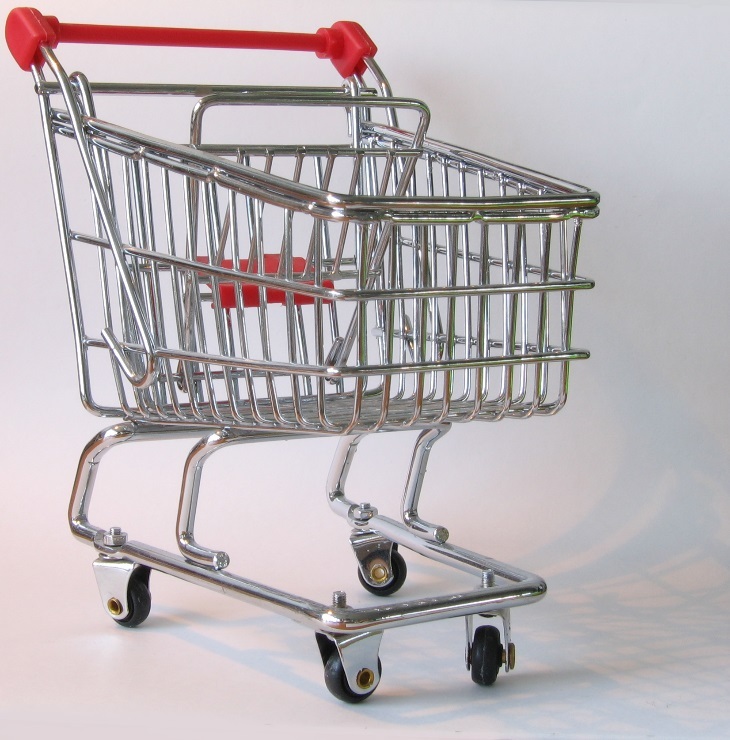 Lower oil and gasoline prices have freed up cash for consumers to pay down debt and load up on durable goods, like some fresh new wheels. Despite a number of positive factors supporting stock prices near all-time record highs and providing plenty of attractive opportunities, there are plenty of risks to consider. If you watch the alarming nightly news stories on TV or read the scary newspaper headlines, you’re more likely to think it’s Halloween season rather than Christmas season. At the center of the recent angst are the recent coordinated terrorist attacks that took place in Paris, killing some 130 people. With ISIS (Islamic State of Iraq and Syria) claiming responsibility for the horrific acts, political and military resources have been concentrated on the ISIS occupied territories of Syria and Iraq. Although I do not want to diminish the effects of the appalling and destructive attacks in Paris, the events should be placed in proper context. This is not the first or last large terrorist attack – terrorism is here to stay. 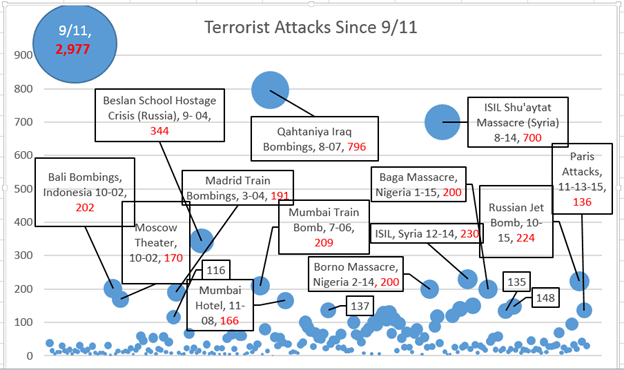 As I show in the chart below, there have been more than 200 terrorist attacks that have killed more than 10 people since the 9/11 attacks. Much of the Western military power has turned a blind eye towards these post-9/11 attacks because many of them have taken place off of U.S. or Western country soil. With the recent downing of the Russian airliner (killing all 224 passengers), coupled with the Paris terror attacks, ISIS has gained the full military attention of the French, Americans, and Russians. 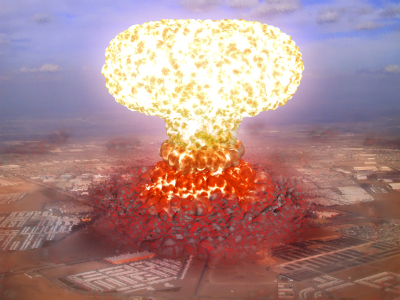 As a result, political willpower is gaining momentum to heighten military involvement. Investor anxiety isn’t solely focused outside our borders. The never ending saga of when the Federal Reserve will initiate its first Federal Funds interest rate target increase could finally be coming to an end. According to the CME futures market, there currently is a 78% probability of a 0.25% interest rate increase on December 16th. As I have said many times before, interest rates are currently near generational lows, and the widely communicated position of Federal Reserve Chairwoman Yellen (i.e., shallow slope of future interest rate hike trajectory) means much of the initial rate increase pain has likely been anticipated already by market participants. After all, a shift in your credit card interest rate from 19.00% to 19.25% or an adjustment to your mortgage rate from 3.90% to 4.15% is unlikely to have a major effect on consumer spending. In fact, the initial rate hike may be considered a vote of confidence by Yellen to the sustainability of the current economic expansion. Regardless of the state of the economic environment, proper investing should be instituted through an unemotional decision-making process, just as going shopping should be an unemotional endeavor. Price and value should be the key criteria used when buying a specific investment or holiday gift. Unfortunately for many, emotions such as greed, fear, impatience, and instant gratification overwhelm objective measurements such as price and value. As I have noted on many occasions, over the long-run, money unemotionally moves to where it is treated best. From a long-term perspective, that has meant more capital has migrated to democratic and capitalistic countries with a strong rule of law. Closed, autocratic societies operating under corrupt regimes have been the big economic losers. With all of that set aside, the last six years have created tremendous investment opportunities due to the extreme investor risk aversion created by the financial crisis – hence the more than tripling in U.S. stock prices since March 2009. When comparing the yield (i.e., profit earned on an investment) between stocks and bonds, as shown in the chart below, you can see that stock investors are being treated significantly better than bond investors (6.1% vs. 4.0%). Not only are bond investors receiving a lower yield than stock investors, but bond investors also have no hope of achieving higher payouts in the future. Stocks, on the other hand, earn the opportunity of a double positive whammy. Not only are stocks currently receiving a higher yield, but stockholders could achieve a significantly higher yield in the future. For example, if S&P 500 earnings can grow at their historic rate of about 7%, then the current stock earnings yield of 6.1% would about double to 12.0% over the next decade at current prices. 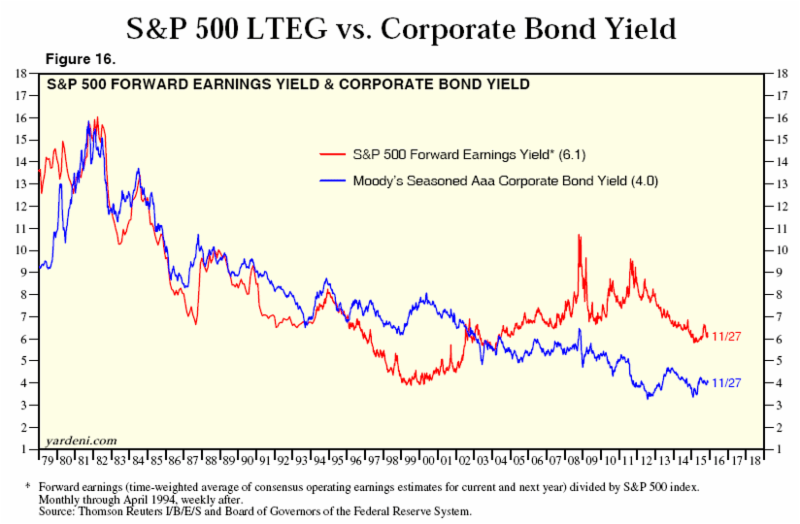 The inflated price and relative attractiveness of stocks looks that much better if you compare the 6.1% earnings yield to the paltry 2.2% 10-Year Treasury yield. This analysis doesn’t mean everyone should pile 100% of their portfolios into stocks, but it does show how expensively nervous investors are valuing bonds. Time horizon, risk tolerance, and diversification should always be pillars to a disciplined, systematic investment strategy, but as long as these disparities remain between the earnings yields on stocks and bonds, long-term investors should be able to shop for plenty of doorbuster discount bargain opportunities. DISCLOSURE: Sidoxia Capital Management (SCM) and some of its clients hold positions in AMZN and certain exchange traded funds (ETFs), but at the time of publishing had no direct position in any other security referenced in this article. No information accessed through the Investing Caffeine (IC) website constitutes investment, financial, legal, tax or other advice nor is to be relied on in making an investment or other decision. Please read disclosure language on IC Contact page.